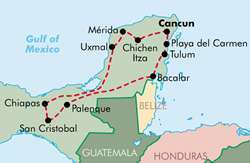 This trek is an exciting mix of tropical Mexico, ancient Mayan Indian cultures, steamy jungles, mystical highlands and the enchanting, inviting beaches of the Caribbean. Discover the fascinating, ancient Mayan city of Chichen Itza before heading to the capital of the Yucatan, Merida. We can shop in the large markets, dine in the outdoor cafes and discover the cultural heritage of this great colonial city. Travel into the heart of the Yucatan to climb the heights of the Pyramid of the Magician at the fabled city of Uxmal. 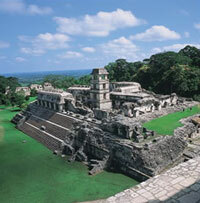 Enter the Jungles of the Lacendon which surround the mystical city of Palenque. Climb the stairs of the Temple of Inscriptions and scan the horizon from the observatory as did the Mayan priests/astronomers centuries ago. Jungle gives way to the lush mountain highlands of Chiapas, passing quaint Indian villages, bountiful coffee plantations and the refreshi ng waterfalls of Agua Azul en route to San Cristobal de las Casas. Wander its bustling streets, teeming with colourful Indian markets and beautiful handicrafts. Outlying villages, such as San Juan Chamula, where the present day Mayans are garbed in their traditional clothing and speak Tzetzal and Tzotzil dialects, the languages of their ancestors. Drop out of the highlands and cross the vast Yucatan Peninsula, passing pyramids and ancient cities of the Maya before arriving at the Caribbean coast in Quintana Roo. Stop for a refreshing swim in the exotic lagoon of Cenote Azul - a fitting introduction to the relaxed pace of the Caribbean. Our coastal camp near Tulum is surrounded by swaying palm trees, white sandy beaches and sparkling blue waters. Days are spent relaxing on pristine beaches, visiting nearby resorts or exploring underwater wonders of natural parks such as Xel Ha, before returning to Cancun. Click on the links at left to exploreour large selection of other Cancun Tours and Activities.